Choose a photo that shows your dog clearly and size it so that it is about 4″ tall. 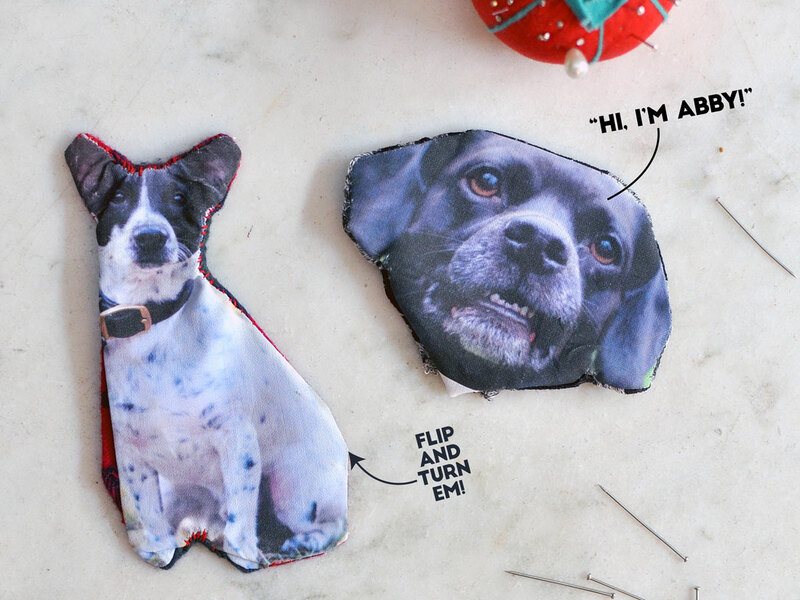 If you are making more than one ornament, place multiple images on a single page, making sure there is at least an inch between the edge of each dog. Print at least one tester on regular printer paper first, so you know that the printed images will be the right size. 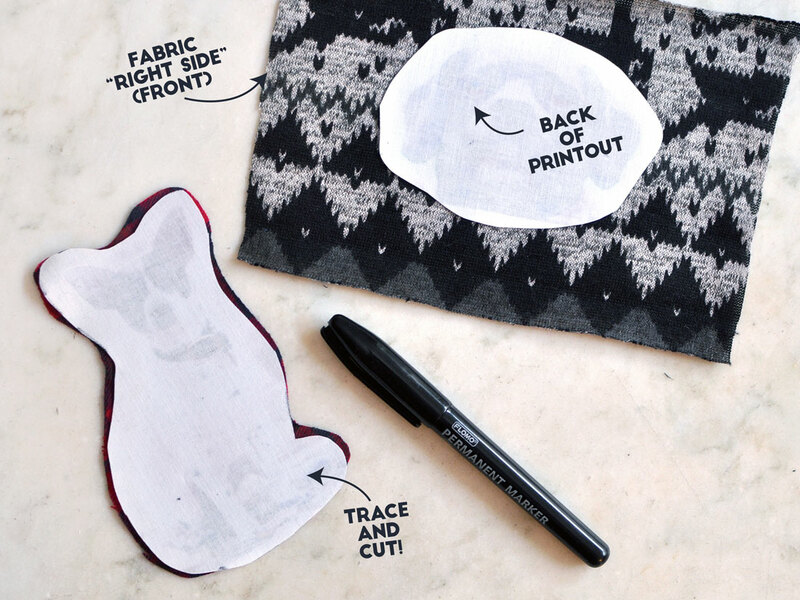 Once you print on your fabric sheet, follow any directions on package to ensure that the ink will set. 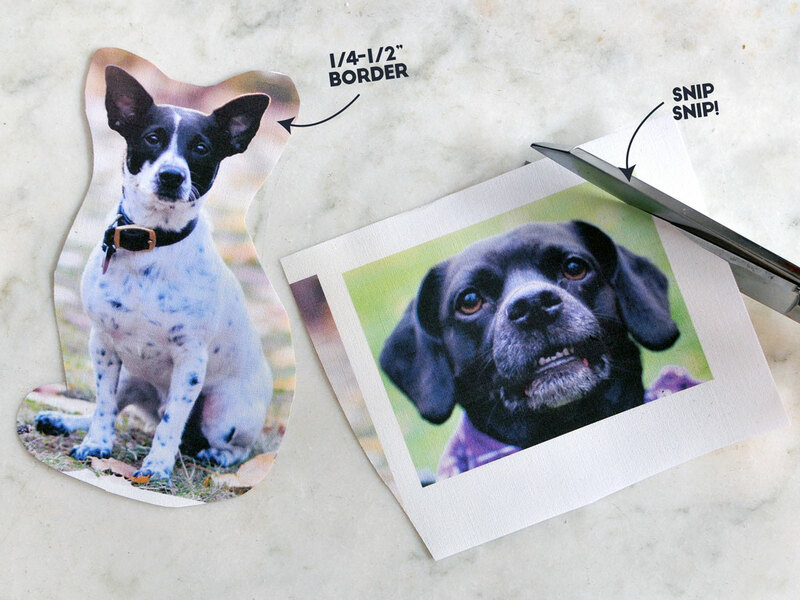 Once you have successfully printed and set the final image, cut it out leaving a quarter- to half-inch border. Place the cut piece on your backing fabric, making sure to have the right side of each facing the other. Carefully trace the top piece, then cut your backing fabric out on this line. Align the two pieces again so that the good sides face each other. 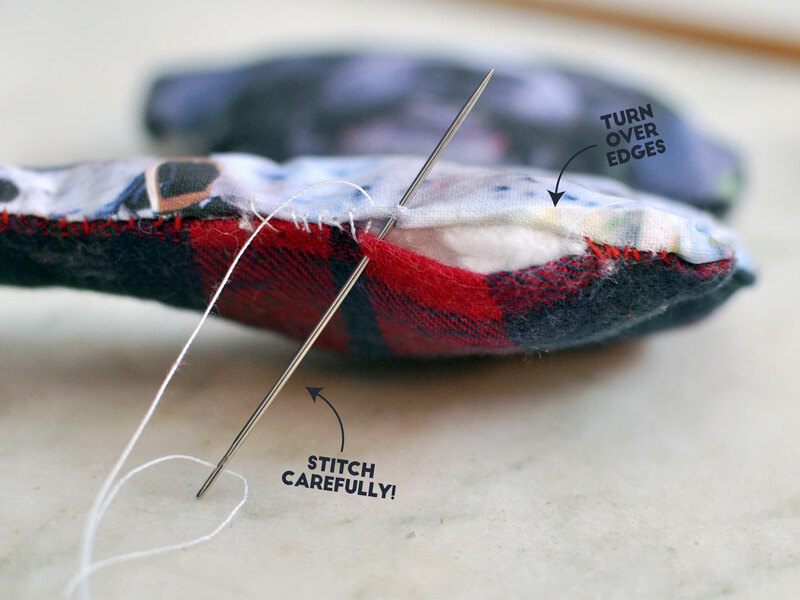 Pin the edges so that they will stay lined up while you sew. Sew the two pieces together. Try to get as close to your dog’s border as possible — you might want to draw an outline to follow. Be sure to leave an opening that is about an inch long. Turn your ornament “right side out.”. Use a chopstick or other dull stick to poke out the appendages. 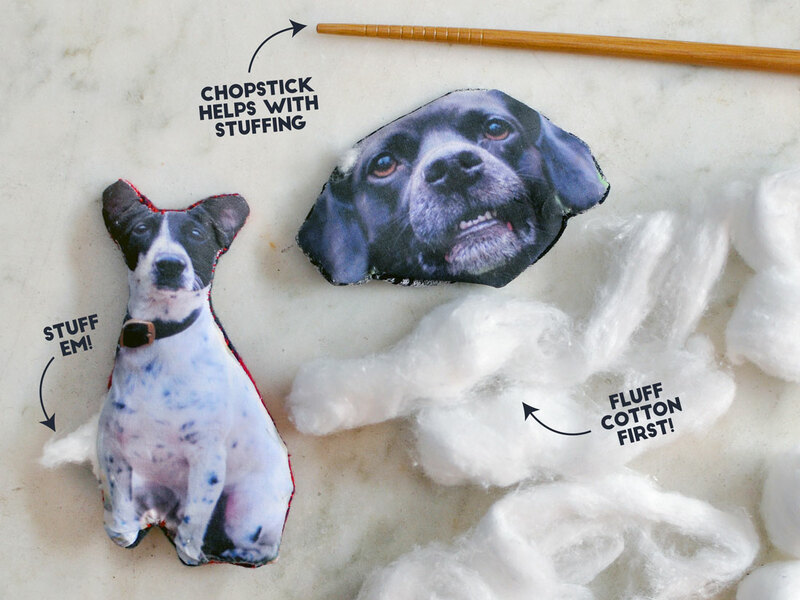 Using the chopstick as a tool, stuff the cotton or polyester fiber filling into every crevice. If using cotton balls, fluff each one before stuffing it. 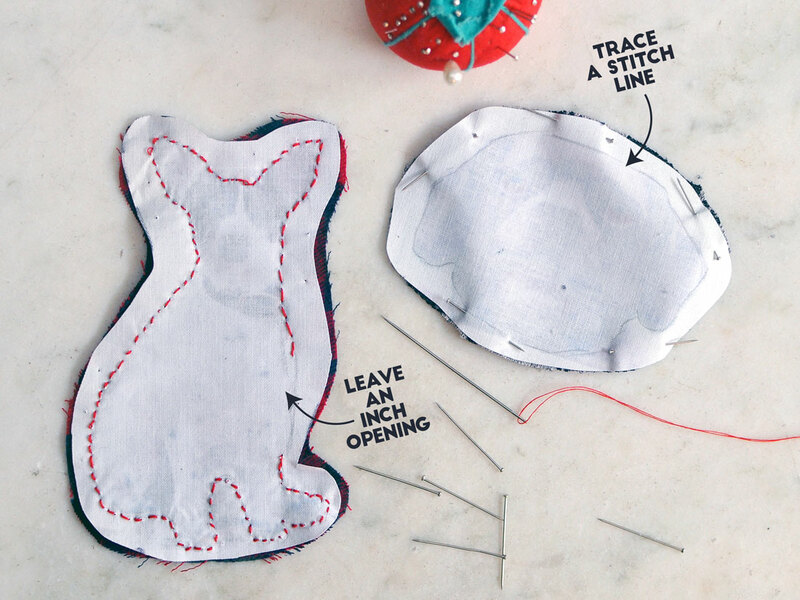 Turn in the fabric edges at the opening and sew it up neatly! 9.) Time For Your Loop! Thread your cord into a needle with a large eye, then poke it through the stuffed ornament in the appropriate location. Once you have both ends free, tie a knot and trim! 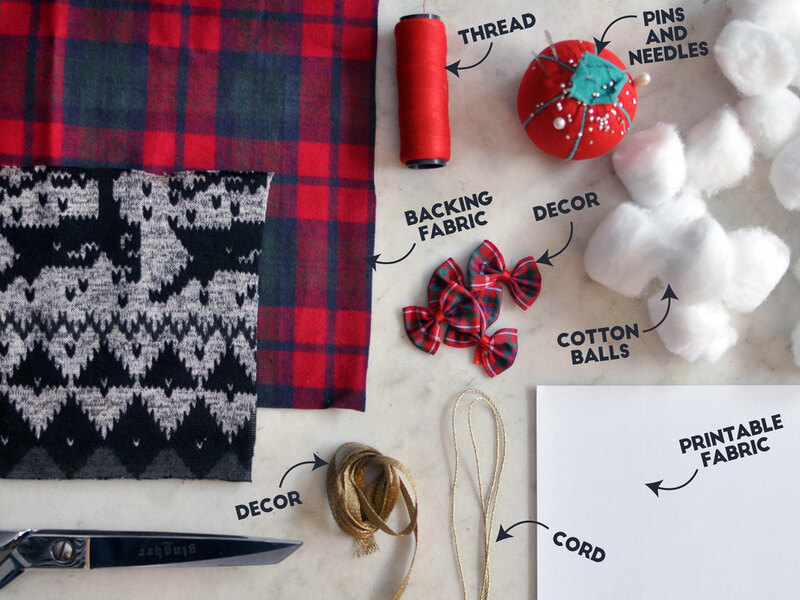 Using a hot glue gun or needle and thread, decorate your ornament using bows, ribbon “collars,” or anything you can think of! • Tiny legs and ears are HARD! I had a hard time with Henry’s tiny feet, especially since the printable fabric is pretty stiff. Try to keep your shapes simple — like Abby’s head — to ensure that your final product looks good. 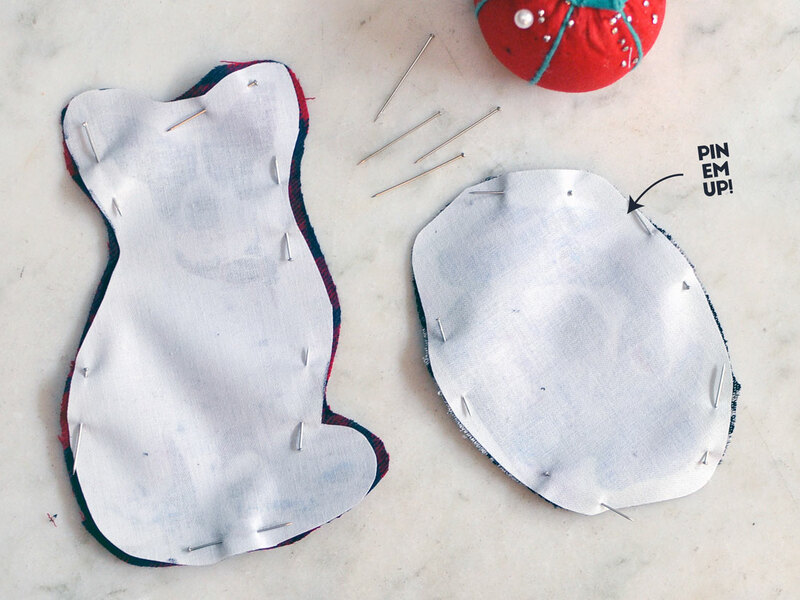 • You can make these ornaments any size and shape you’d like! • If you don’t know how to sew, a quick Google search will reveal several great tutorials. You can also check out Pinterest and You Tube. 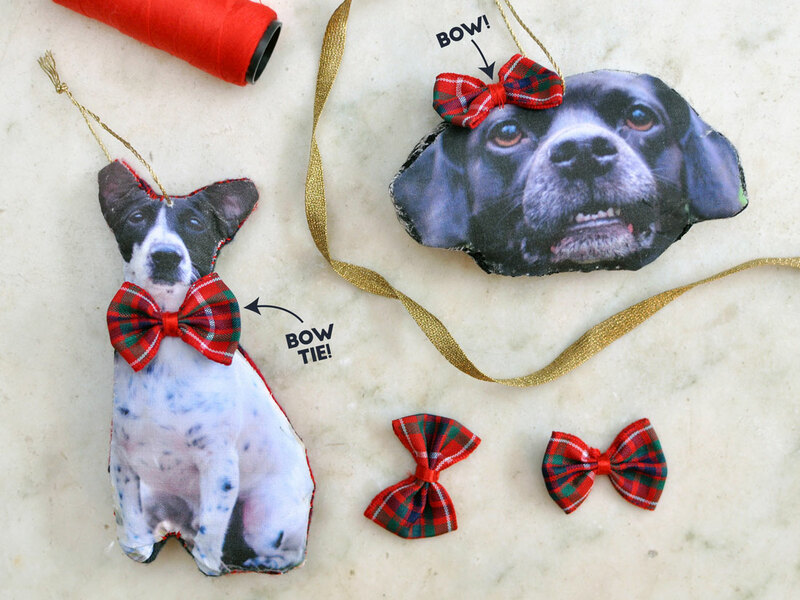 • These ornaments make affordable gifts for all of your dog-loving friends and family members! Did you try this tutorial? Email us your photos or tag us on Instagram! This looks easy enough for ME to do, thanks! Haha thank YOU! 🙂 Enjoy! You had me at EASY lol I am not very crafty but I do believe I can do this! It is so cute! LOVE it and our Lyla will be happy to be on our tree. It is also a great way to honor our pups who have passed. Thank you! The idea of honoring pups who have passed is such a great idea! I hadn’t even thought of that. I’ll have to make some of the late, great Tuxie and Rory who I still miss all the time. This is so wonderful! I love homemade and personalized gift ideas (for my own tree, too!) This is really cute. Thank you! Pinning and sharing over on my FiveSibes: Siberian Husky K9 News & Reviews Facebook page! This is Inspired!! 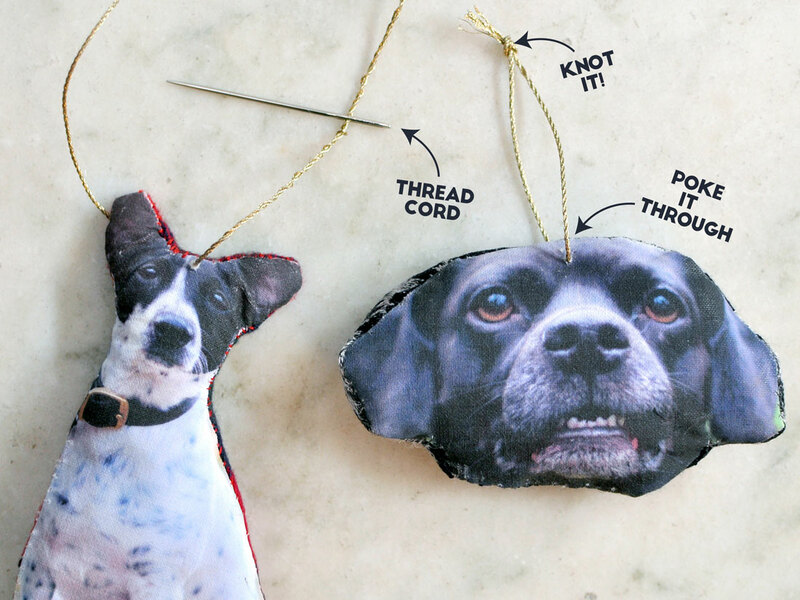 How great to make a special ornament for your pup or cat? I can see a cat kicking the stuffing out of its mini-me ROFL!!!!! These look so adorable and not too tricky to make. Excellent tutorial. I have made cardboard flat Kilo, decorations using photos and t-shirts but never tried printing and sewing like this. What cute gifts and ornaments. Oh how I love this!! SO darling!! easy too … love it! These are adorable! I think I’ll try to make some for gifts, but it might take me to next year to get around to it. OK, so I am laughing that this is your post today …considering my post today. I really want to try this, but I am pretty sure I would fail – in an epic way! What I failed to mention in my post this morning, is that I almost flunked Home Economics (specifically sewing) when I was in middle school. But these are so adorable and it definitely makes me want to not give up on the DIY thing! Hahaha it’s funny timing! 🙂 From the beginning, I meant to do more DIY posts and just haven’t had the chance so I really want to do more. I doubt you would fail! Great idea! It was difficult for me to keep all of Truffle and Brulee’s ear tufts when I made their flats for BlogPaws. Great DIY project! I think I could do it and I’m not crafty at all. Wow i love your idea. I like DIY things and i make a lot of handmade things for my family&friends but i haver tried making ornaments before. Thank to for you post, now can i can decorate my Chrismas trees, with my own dog’s pictures! Thank you for checking it out! Enjoy!